Every now and again you find a toy that is so stupid that you wonder why any toy company would think it would ever have selling potential to children. This is especially true when the toy has little or no play value, and is clearly constructed from left over doll parts that the toy company had laying around in a warehouse. I would like to present one of the finest examples of one of these terrible toys that I have found so far. Ladies and gentlemen, I now present to you Toe-kins. Yes, that toy is constructed of a tiny baby doll shoved inside a larger doll leg. This little beauty was made by legitimate toy company Uneeda toys. Uneeda made dolls from 1917- 1991. They also made Wishniks, which were knock off Troll dolls, but were still very popular and are sought after today. 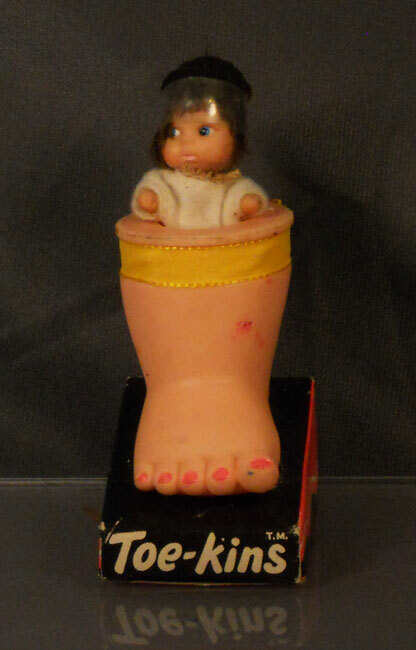 I wish I could have been a fly on the wall in the pitch meeting where someone pitched the idea for the Toe-Kin, which sounds like a clever name until you think about the fact that this doll is in a foot, or even more a lower leg, not a toe. 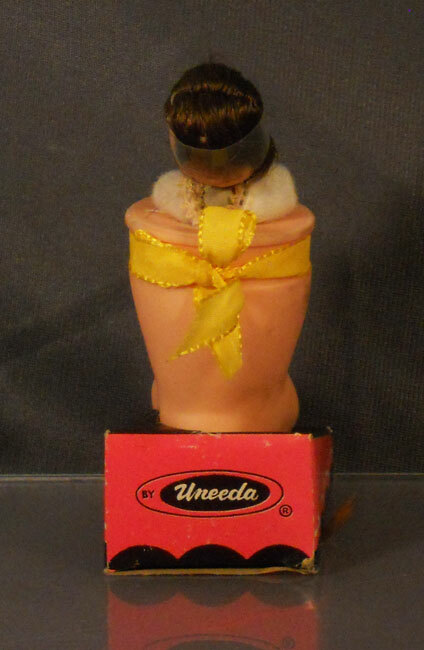 Uneeda toys tried to disguise the fact that this toy is clearly made out of a left over baby doll leg by putting a pretty yellow ribbon around the mushroom plug at the top of it, but they aren’t fooling anyone. For those of you who might not be as familiar with toy construction techniques, mushroom plugs are often placed where two movable joints connect on a toy. If you have ever pulled the head off of one of your Barbie dolls or action figures, you will most likely find a mushroom plug where the neck connects to the body. It looks kind of like a mushroom most of the time, hence the name. In the case of this doll leg, it probably would have been sewn onto a soft doll torso and the indentation from the mushroom plug would be where they stitched it into place. Now, if you thought that the cute little doll sitting inside of the foot, which is about the size of a Kiddle doll, was removable you would be WRONG. That little lady is permanently fixed to that doll foot for better or worse. There are so many questions I have about this ridiculous toy. Is the concept of this thing supposed to represent a little girl with a hideous deformity where instead of having a normal lower torso she just has one giant leg? Is she piloting a giant leg as her own mode of completely awesome transportation? Is she just chillin’ inside a giant leg just because she can? The poor execution and lack of a back story make it impossible for us to truly know. Do Toe-kins come in both right and left feet? Are there more Toe-kins in the series? Probably, but I haven’t found any more to prove whether or not that is true yet. I know it might seem like I am hating on Toe-kins, but I can honestly tell you that I was truly excited when my brother found this for me at a toy show. Yes, Uneeda toys deserves to be scolded for trying to market such a lame concept to children. And I pity the poor kid whose grandma or weird aunt gave them one of these things for their birthday. At the same time, this toy is hilariously bad, and any object that can make me laugh or put a smile on my face is worth owning in my book. That is why I am sharing the Toe-kin with you, internet community. I hope it makes you laugh and puts a smile on your face, too. If so, the Toe-kin is doing its job. This entry was posted in 1960's, 1970's, Amy, Dolls, Humor, Miniatures, Monsters, Toys, Weird. Bookmark the permalink. And dare I say it…did some mean adult put a Toe-kin in a kid’s Christmas Stocking? What, not token black Toe-Kins? Holy cow…I mean, holy TOE! That’s ACTUALLY kind of CUTE (if ever so slightly wrong and creepy…from a…medical…view…OMG! ), except that I am CERTAIN that somewhere, there’s a grown man (or woman) throwing that poor little doll out of an apartment window, just so that they can kiss that big foot each night, and I KNOW that that person is neither YOU, nor ME! LOL!